Throughout most of the spring and summer, we have featured a number of blog posts talking about hay moisture testers and electrified fencing. With the end of summer fast approaching, it is time to get ready for the fall and winter seasons. That means making plans for winter hay storage. One of our temporary hay storage buildings could be the solution you have been looking for. We sell multiple sizes of storage buildings made with heavy-duty PVC fabric and galvanized steel framing. The advantage of using one of these temporary buildings as opposed to building a new barn is flexibility. Of course, lower costs are a big advantage as well. At any rate, it helps to start making preparations for installation now while the weather is still cooperative. • Power Lines – Falling power lines could cause a lot of problems for your temporary storage building. As such, choose a site that is far enough away from power lines to be unaffected if weather brings them down. • Snow Drifts – You know from experience where snow tends to accumulate on your property. It is best to avoid a location that could encourage snow drifts to accumulate along the sides or on top of the building. Snow on top is especially troubling because it adds weight. • Overhead Threats – Also make sure to choose a site free of overhead threats like large tree branches or ice dams that may fall off a nearby home or barn. • Underground Utilities – Lastly, you will be driving anchors into the ground to hold your temporary storage building in place. Choose a site you know is free from underground cables and pipes. If you are not sure where cables and pipes are located on your property, call your local utilities and ask them to come out and mark locations for you. Once you have chosen a good site, you need to prepare it for installation. If the site is not already level, start the preparation process by addressing this. A level site is important so that moisture does not collect at one end of the structure, thereby spoiling some of your crop. If necessary, dig some trenches to provide a bit of drainage underneath the crop. If you plan to install the building on top of a concrete pad, digging trenches will not be possible. You can accomplish the same thing by stacking your hay on top of pallets. That way, any moisture underneath will be kept away from the hay. If you need to drill anchor holes, now is the time to do it. Drill your holes and insert anchors into them to keep them from closing back up between now and installation day. Lastly, clear out debris, equipment, and anything else that might act as a hindrance to installation. Plan on a clear area of 15 to 20 feet around the entire perimeter of the site. You do not want to waste time and effort moving things on the day of installation. If you are thinking of installing a hay storage building in anticipation of the coming winter, now is the time to start making plans. It is already mid-August. Cold temperatures and snowflakes are just a couple of months away. We are now well into the start of the summer season. That means hay growers around the country are already looking at the first harvest. Now is the time to start thinking about storage options for the 2018 season. How growers store their hay partly determines what kinds of losses they will experience as a result of the forces of nature. As always, moisture is a crucial factor. We sell a variety of moisture testers that make it easier for growers to achieve that perfect balance that minimizes hay losses. But a moisture tester alone will not do the trick. Growers also need to use a bit of common sense when it comes to storage. Whether hay is stored in the field or brought into a covered area, it has to be protected against both drying out and excessive moisture. The least expensive and labor-intense way to store hay is to leave it in the field as rolled bales. This method is actually pretty common for the first crop of the year. In climates where three crops are grown, the second crop may also be left in the field. Field storage is fast and easy, too. One of the big dangers of storing in the field is losing too much of the crop to dry matter loss. However, dry matter loss is easily controlled by getting hay up off the ground. Allowing hay to remain in contact with the ground can lead to losses of up to 30% or more under normal circumstances. Fortunately, breaking contact between hay bale and the ground is not difficult. Growers can roll finished bales onto pallets, blocks, or even tarps. Another option is to store hay on a layer of gravel. Storing hay in the field also exposes it to precipitation, and that is where a good moisture tester becomes important. Hay allowed to get too wet is subject to both spoilage and spontaneous combustion. Throwing a temporary hay tarp over exposed bales might be necessary if the weather turns especially ugly and stays that way for a while. Bringing hay out of the field to store it under cover is generally considered the best way to protect a crop and minimize losses. But it is also expensive if you don’t already have a structure in place. Building a barn is not an option for a lot of growers, many of whom turn to temporary storage buildings like the ones we sell. Another option for bringing hay out of the field is to stack it in large quantities and then cover the entire stack with tarps. This is a strategy mainly used for the last crop of the year; it’s impractical for the first crop of spring. That hay needs to be easily accessible for both sale and use by the grower. Even hay stored indoors is subject to volatile moisture levels. So again, keeping the crop off the ground is a wise idea. Pallets, blocks, and even used tractor tires are excellent storage options for getting hay elevated. The goal is to allow circulation under the hay so as not to allow mold to grow. Experts recommend using a cost analysis reckoning to determine the most suitable option for early-season hay. In other words, determine how much it would cost per bale to implement your chosen storage solution. Take that number and compare it against the expected losses for that solution. Choose the solution that is most financially viable for you. There are lots of different ways to store hay using tarps. In this post, we will outline the steps for building a quick and dirty hay storage system that will keep your hay safe and dry without the need for a permanent structure like a pole barn or garage. Bear in mind that this description is just a general guide. You may want to modify what you read here to better suit your circumstances. Also remember your main goal: to protect hay from the elements so as to reduce spoilage as much as possible. 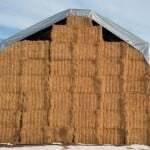 Unprotected hay can suffer spoilage rates of up to 20%, making for significant losses in an exceptionally bad season. To build your quick and dirty hay storage system, you will need hay tarps, rope, and PVC piping. Spiral anchor pins are optional if you would rather stake down the tarp rather than running rope under the bales of hay. One last thing before we get to the build: depending on how you build your system the hay storage system designed here work best with round bales and square bales stacked in a pyramid. Use your own discretion when building your system. The first step is to measure out the storage space. A 28-foot tarp should be good for 70-75 bales of hay stacked in a pyramid configuration. You can place the first layer directly on the ground or lay down some gravel first, it’s up to you. Most farmers just go straight to the ground. Once your storage space has been measured out, lay ropes across the space at 3 foot intervals. You will eventually be pulling these ropes up and using them to secure your tarp, so leave some excess. Now you are ready to begin stacking your hay right on top of the rope. When stacking is complete, you are going to lay PVC pipe across the top of the stack to prevent the tarp from directly contacting the hay. This is important for allowing air flow to move over the top of the stack. If you don’t do this, you could get moisture build up that could promote mold or mildew growth in the top few inches of the pyramid. Next, stretch your tarp out on the ground. With someone to help you, you can now lift the outside edge and pull the tarp up and over the entire stack. Do your best to center the tarp before tying it down. Also, do not worry too much if the tarp seems a bit too small. It’s better to have less tarp to work with than too much. Next, string the ropes through grommets in the tarp and tie everything off. Your ropes should have enough tension to keep the tarp taught. The lower edge of the tarp should be positioned just slightly lower than the widest point of the stack in order to allow rain to run off. Lastly, insert PVC pipe where the tarp makes contact with the first layer of hay. The tarp should already have enough tension to hold the pipe in place. The idea here is to replicate what you did at the top of the stack: keeping the tarp from making direct contact with the hay. If you did everything correctly, you should have a complete stack of hay properly covered and secured against the elements. After installation though, it is important to check the tension of the ropes every week or so. Your haystack will settle somewhat, so you will need to tighten the ropes throughout the storage season.